QUEZON CITY—UP CIFAL Philippines Director Dr. Edna Co moderated a panel discussion on “Situating Gender in Philippine Migration Landscape: Trends, Challenges and Emerging Issues” on November 5, 2018. 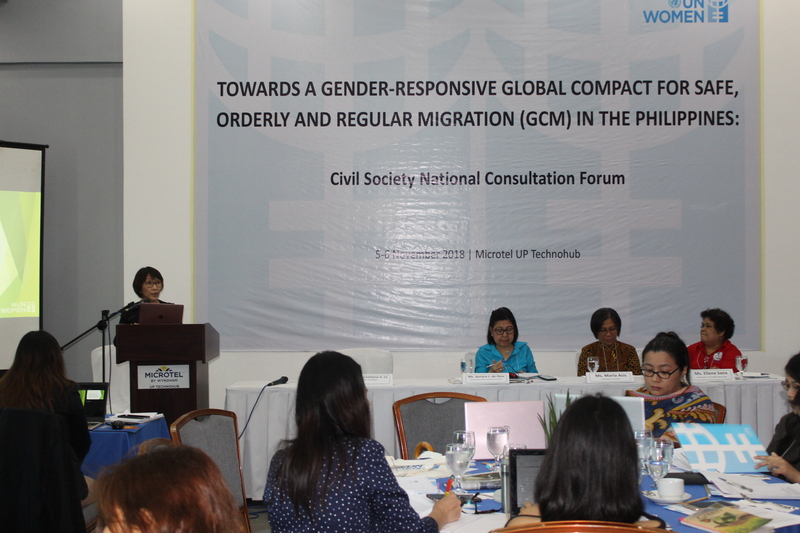 The panel discussion is part of the two-day national consultation forum with the civil society entitled “Towards A Gender-Responsive Global Compact for Safe, Orderly and Regular Migration (GCM) in the Philippines,” organized by the United Nations Women. Panelists included Ellene Sana, executive director of the Center for Migrant Advocacy; Marla Asis, director of research and publications at the Scalabrini Migration Center; and Aurora de Dios, executive director of the Women and Gender Institute. They highlighted that women migrant domestic workers are vulnerable to exploitation and abuse because of the private setting of their job. Despite the existing laws on protecting migrants, such as Republic Act 8042 or the Migrant Workers Act of 1995, and the international agreements ratified by the Philippines, the panelists argued that the country falls short in the implementation. Dr. Co summarized the panel discussion and emphasized that international laws are meant to be common good laws and therefore should not be seen as conflicting with national laws. The participants in the UN Women forum drafted a joint statement of the civil society and the government on “Ensuring a Gender-Responsive GCM in the Philippines,” which will be finalized before the launch of the GCM in December 2018.